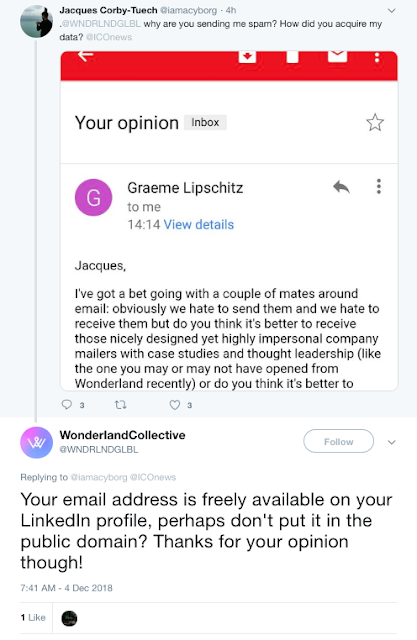 I'm not quite sure who Wonderland Collective are, but when somebody asked them why they are sending unsolicited email, they decided to complain back, instead of apologizing. But wait, there's more! Be sure to read the whole thread. I sort of assume at some point they'll be changing their tune and apologizing. Unless they prefer to be blacklisted. I wonder if they did something that could get them into enough trouble that they'd even get fined? I'm not sure, as I don't know enough about what's happening here. But sending unsolicited spam, then barking at people who ask you to stop, sure doesn't seem to me like a good way to run a business.